We all fall down, but we get up again! In Taylor and DaWalt’s recent study, about half of the participants experienced some “disruption,” like being fired, or leaving a post-secondary education program. 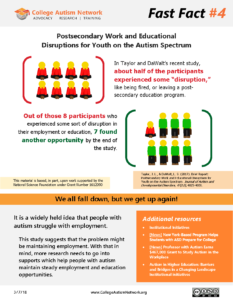 Out of those 8 participants who experienced some sort of disruption in their employment or education, 7 found another opportunity by the end of the study. This material is based, in part, upon work supported by the National Science Foundation under Grant Number 1612090.